Receiving the first utility bill after a solar system is switched on is an exciting moment. From that first bill onward, solar homeowners are a different kind of electricity customer. They produce energy as well as consume it. Their relationship with the utility company changes and so does their utility bill. This can lead to confusion from homeowners and calls to the utility customer service line. Utility company customer service teams answer numerous questions from new solar homeowners. PHI (Pepco and Delmarva Power) for example, receives questions about how to read net energy metered (NEM) bills, NEM credits, and budget billing, and has self-help customer service FAQs for solar homeowners. Solar United Neighbors also receives questions from new solar owners curious about the way their bill looks, so we decided to cover a couple common topics. The way your bill looks pre- and post-solar will depend on your utility. Here we’ll be focusing on the PHI companies (Pepco and Delmarva). Regardless of your utility company though, some or all of the solar energy you produce at any given moment is consumed immediately by your home. Excess energy goes through your meter and creates a billing credit. This can create confusion when a homeowner looks at their own energy reporting for their solar array’s inverter and sees a higher number of kilowatt-hours (kWh) for generation than what is reported on their electricity bill. Only the solar energy that goes through your electricity meter and back out to the grid will be seen and recorded by your utility company. Let’s say your inverter’s generation report shows you made 800 kWh of energy during that same period. This would be the outbound energy from the inverter to your home. Based on the above, that means you consumed 422 kWh (800 kWh – 378 kWh) of solar energy on site as soon as you made it over the course of the reporting period. But, your total home electricity usage for that period is 1328 kWh. That’s the 906 kWh you consumed from Pepco added to the 422 kWh you used immediately from solar. 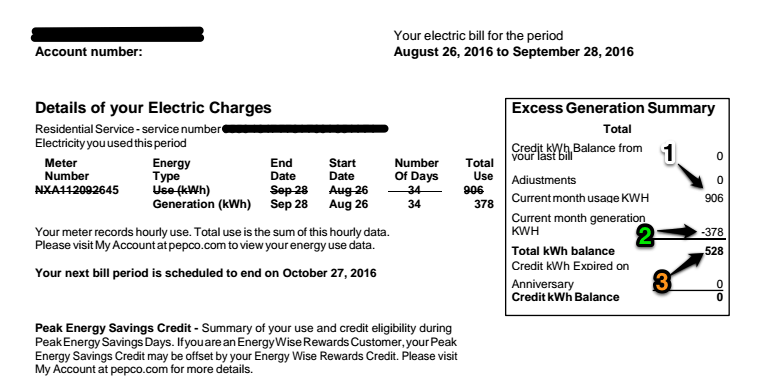 Because you produced 378 kWh in credits during the month, Pepco only billed you for 528 kWh of the energy they saw you use at the meter. Some utility customers use budget billing. This payment method averages the cost of electricity service over the course of the year and deducts equal amounts each month. To calculate this amount, the utility company uses the previous year’s usage as the starting point. Each year that amount is re-calculated for the next year. If the customer overpaid (i.e. they used less electricity than budgeted) during the year they get a credit. If they underpaid (they used more electricity than budgeted) they get billed more. When solar is added to budget billing, the credits you generate from solar will reduce your bill. But the initial budget billing amount will not be changed to reflect your overall reduced usage from solar until the next budget billing yearly re-calculation. Many solar homeowners find it less confusing to remove the budget billing feature from their accounts. If you have questions about your electricity bill and the information being displayed you should contact your utility’s customer service department.